We’re taking a peek inside the classroom to offer students a sampling of what they might experience. This week we visited a marine maintenance mechanics class to see learning in progress. Students working toward TCC’s Career Studies Certificate in Diesel Marine Technician receive training on modern marine diesel engines and related systems. 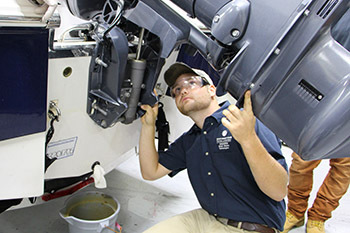 Marine Maintenance Mechanics (MAR 130) gives students hands-on training on inboard and outboard motors, sterns and shaft drives. Hampton Roads is home to plenty of ports, shipyards and marinas. With ships and boats moving through local waterways, trained diesel marine technicians are in high demand. “We’re teaching them everything they need to know to work on pleasure craft and larger vessels. From here, they will be ready for work in local marinas and shipyards,” said Abraham Arispe, diesel marine professor. This class combines lecture and laboratory work, where students work together in groups. Teamwork is key! Arispe served as Machinery Technician Chief in the U.S. Coast Guard for 22 years. He has experience working on every kind of machinery and even served as an instructor in the military. Arispe holds a master’s in education and is working on his doctorate in education. He is a full professor at the college.